Ingrown toenail (also known as onychocryptosis) is a painful toe problem that involves a sharp spike of nail digging into the surrounding skin. They cause swelling and redness at the edge of the nail and can be very painful. Infection of the skin is quite common, resulting in warmth, redness, yellow discharge and tenderness when walking. Recurrent ingrown nails can cause disruption to normal everyday activity and be painful in footwear. There are several causes of this painful nail problem and correct diagnosis of the cause is essential for successful treatment and prevention of recurrence. We take the time to diagnose the cause so that you will have the best results. How to treat ingrown toenail? Conservative treatment of ingrown toenails can be very successful. It involves removal of the spike, a clean and appropriate dressings. We understand how tender it can be so rest assured, Dr Azarian is highly skilled and experienced in fixing ingrown toenails as gently as possible. We also offer pain relief inhalers and anaesthetics if required. In cases where there is an infection, antibiotics will be prescribed. Can I Get My Ingrown Toe Nail Fixed Long-Term? In cases where ingrown nails or infection has been a recurrent problem, a solution exists. We offer ingrown toenail surgery in our consulting rooms as well as day surgery hospitals if sedation is required. The cosmetic appearance of your nail after surgery will depend on the surgeon and the technique they use. It also depends on your nail shape and thickness. Dr Azarian takes great care to produce cosmetically pleasing results after surgery. In most cases there are no signs of surgery or scars after healing has taken place. Don’t put up with pain anymore! Around 99% of the time only a small section (2mm) of the nail is removed, not the entire nail. Toe nail surgery is considered to be a minor procedure. As a Podiatric surgeon, Dr Azarian is able to perform several minor surgical procedures to deliver the best results for you. For those who are needle shy or extremely anxious, we have options ranging from pain relief inhalers to, sedation and general anaesthesia. Two of the most commonly performed procedures include chemically stopping regrowth of the spike or physically removing the nail root and surrounding thickened tissue. We will discuss the right type of procedure for your toe with during your consultation. Due to the nature of the procedure you can walk immediately after and in most cases resume normal activity the following day. Many patients are surprised at how pain free they are after nail surgery. Fungal nail infections known as onychomycosis can effect one or all toe nails. They are unsightly and embarrassing for anyone affected by them. They are also very difficult to treat and can take many months or years to clear. Treatment options involve topical liquids, tablets and lasers. In cases where treatment has failed and the entire nail is affected, a minor surgical option exists. 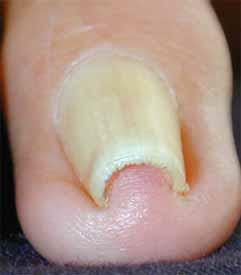 Dr Azarian can remove the infected toe nail and make room for a new nail to grow in its place. Call us today for advice of your nail deformity. Existing patients (and for urgent enquiries), please email Dr Azarian directly at surgery@perthfootcentre.com.au. NOTE: Information provided above is a general guide and is not intended to replace consultation with Dr Azarian. Any surgical or invasive procedure carries risks. Before proceeding, you should seek a second opinion from an appropriately qualified health practitioner. Call today on for a Podiatric surgery consultation.